that will give you a good taste of Languedoc's cuisine. Between the coast and the highlands, vineyards and countryside, enjoy the cuisine of the South of France! 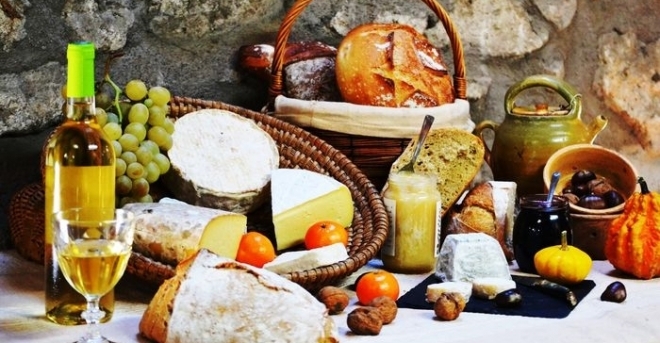 Fish, seafood, cheeses and olives, fruit and vegetables, biscuits, petits pâtés de Pézenas(mutton pies)... From one end of the year to the other, these products are on display at markets and festivals, where you can discover seasonal local produce and our fine wines. Languedoc is a land of vineyards and wineries. The different wine growing areas and grape varieties produce a wide range of wines to sample, giving your taste buds a treat. Languedoc's cuisine is based on top-quality local produce and Mediterranean flavours, a fusion of influences from the Mediterranean sea and the mountains. You'll find produce direct from the farm and fresh local flavours, smells and colours when you visit one of Languedoc's lively markets, where you can try new tastes and make new friends. In Languedoc, there's always a good opportunity to try Mediterranean cuisine, Languedoc wines and seasonal produce. On the coast, in the highlands or in town, go book a table! A gourmet restaurant, country inn, shaded terrace in town or hut on the beach, the choice is yours! Mediterranean cuisine is celebrated at food festivals based around local produce and Languedoc wines. What better way could there be to learn about the skills of the growers and their seasonal produce? Go and meet the masters of flavour, explore the sun-drenched back roads that wind through the vineyards and pretty villages. Just for the fun of it and to sample the delicious produce! No matter what the season is, there will be a recipe handed down by one of our grandmothers to remind you that Languedoc is above all a land of gourmet pleasures. It’s a gourmet’s paradise!